Find some frost salts for Dravynea the Stoneweaver. Talk to Dravynea the Stoneweaver. Obtain a sample of frost salts. Dravynea the Stoneweaver is a Dunmer alteration expert living in Kynesgrove. When she is not working in the Steamscorch Mine, you can find her wandering the town or in the Braidwood Inn. Should you be in the market for some free Alteration training, ask her about her business in Kynesgrove. She will explain that she uses her powers as a mage to keep the mine safe. She is able to make a potion using frost salts to keep the temperature in the mine bearable, but is out of frost salts at the moment. Tell her that you can get some for her. She will off-handedly offer you free training if you actually bring her the salts. The quest will update to "Bring some Frost Salts to Dravynea". While the term "some" is rather ambiguous, only one bowl of frost salts is required to fulfill the objective. If you do not have a sample in your inventory already, there are many ways to obtain a sample: from the corpse of a frost atronach, purchasing one from an apothecary merchant, creating a sample at the Atronach Forge, or placed randomly on shelves. 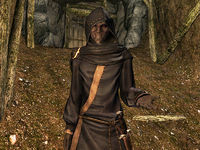 If you are a member of the College of Winterhold, you have access to two free samples in the Hall of Countenance alchemy lab. When you have your sample, take it to Dravynea to complete the quest. She will seem surprised that you actually came through, and will give you a free training session equaling one level of Alteration as a reward. Because this is a favor quest which affects Dravynea's disposition, it will count towards the "Help the People" part of the Thane of Eastmarch quest. This quest can be assigned multiple times, resulting in a +1 Alteration skill improvement every time the quest is completed. Sometimes, doing this quest doesn't raise Dravynea's disposition, it remains at 0 instead of 1 (tested). This may or may not result in not being given the option to marry her (untested). ? On the PC, it is possible to use the console to advance through the quest by entering setstage FreeformKynesgroveA stage, where stage is the number of the stage you wish to complete. It is not possible to un-complete (i.e. go back) quest stages, but it is possible to clear all stages of the quest using resetquest FreeformKynesgroveA. This page was last modified on 22 June 2018, at 04:50.